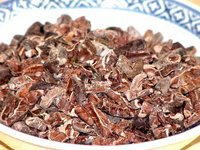 Cooking without a Net: TSIR 8: Wouldn't That Be Good with Cacao Nibs? The minute I read Danielle's theme for this month's Spice Is Right event I knew what I wanted to do. I've been infatuated with cacao nibs ever since I brought them home with me, as you know from my posts here and here. I spend an embarrassing amount of time thinking about them and dreaming about with which foods they would go best. So far, I haven't thought of anything that wouldn't taste better with a little chocolate. Well, apparently liver wouldn't, but that's another story. But there was one dish I knew they belonged with before I had ever tasted them. In fact, I mentioned it when I wrote about it. The warm toasty aroma of the Tandoori Masala I made for Barbara's Back to School Spice Is Right event was already suggesting chocolate and coffee to me. So when Danielle said to use a spice with a dish from a cuisine that doesn't usually use that spice, my choice was obvious. Why not go ahead and add ground toasted cacao nibs to my Tandoori Masala and cook me up some chicken? 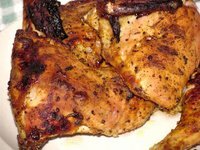 So off I went to fooddownunder.com (surprise, surprise) and found a recipe for Tandoori style chicken. That recipe listed the spices separately, so I used it as more of a springboard than a recipe and used my lovely Tandoori Masala, to which I added a healthy dose of ground cacao nibs. It made such a lovely, delicious chicken. The cacao nibs have a dark, warm toasty flavor that complements the tandoori spices to perfection. I am so glad Danielle chose this theme for this month's event. If she hadn't, it would have just been another great idea I had that I never tried. And that would have been a true shame because it's so good I will be making it again and again. The chicken is the all natural chicken I've been getting at the Apple Market. I can't say enough good things about it. I've been shopping there often enough now that they recognize me, which is a nice feeling. And it was also really nice to be able to ask them to quarter the chicken for me, rather than my having to deal with it when I got it home. Yogurt is an amazing tenderizer. This is the third time I've used it as a marinade for chicken, and each time the chicken has come out juicy and incredibly tender. Even though this bird was in the oven for a long time, it came out tender and flavorful and the white meat had not dried out at all, as it sometimes does when it's roasted for a long time. This easy dish comes out with a rich, complex, layered flavor that tastes like it took long hours and hard work to prepare. The day before you plan to cook the chicken, mix the Tandoori Masala and cacao nibs into the yogurt. 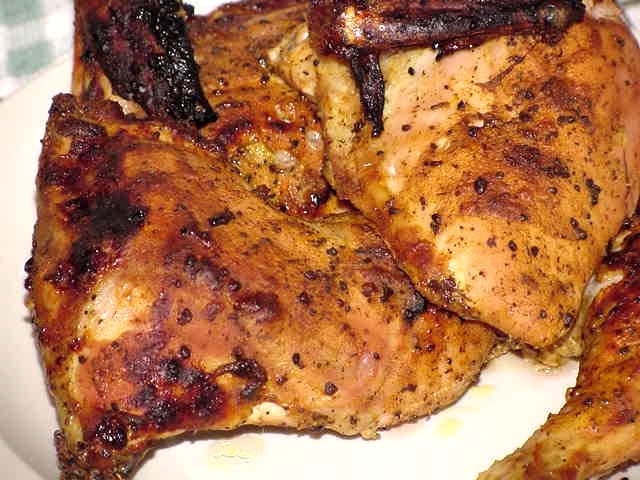 Combine chicken and marinade in a bowl or sealable plastic food-storage bag and refrigerate overnight. To cook, heat oven to 500 deg. F. Place chicken in large roasting pan, brushing with the remaining marinade. Bake 15 minutes. Reduce oven temperature to 350 and continue baking 45 minutes to an hour, or until juices run clear when chicken is pierced with fork. While chicken is cooking, prepare Cucumber-Yogurt Sauce. In medium-size bowl, combine yogurt, cucumber, lime juice, mint and salt. Transfer sauce to serving bowl, cover, and refrigerate until ready to serve. Transfer chicken to serving platter. 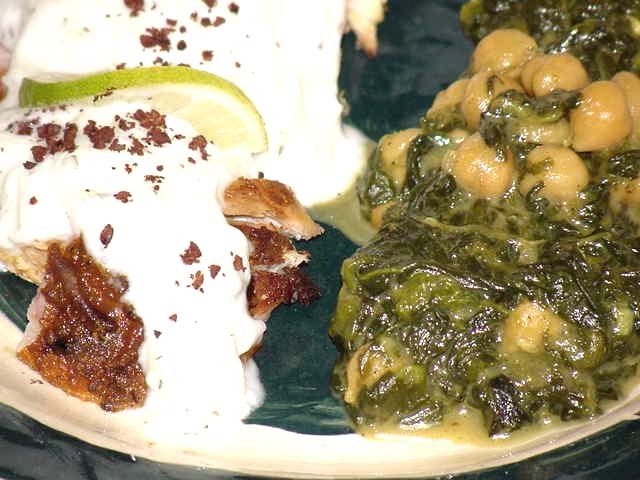 Cover with cucumber-yogurt sauce and garnish with mint sprigs, lime slices, and ground cacao nibs. What an interesting idea! 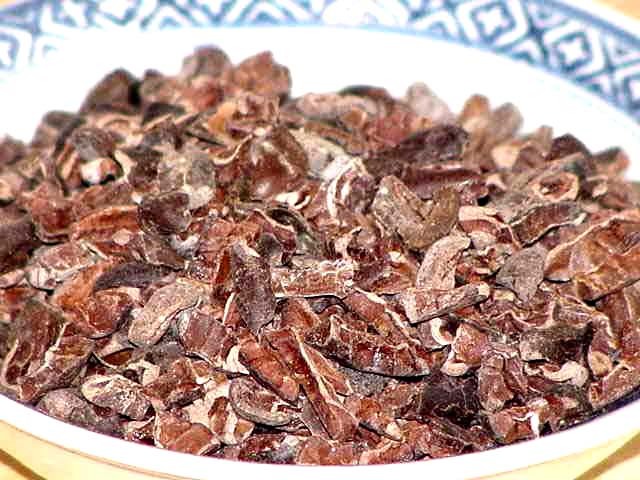 I love cocoa nibs, and I love Indian food, but it never occurred to me to put the two together. Thank you for participating and for being such an inspiration! Yay! I have a stove again! I can make this!